What does everybody want? Headmasters! Trans5mers: Planet of the Earth was not the complete orphanage collapse that Trans4mers: 4ge of Extinc4ion was, but it's still not great. It opens with Stanley Tucci playing a different character than he played in the last movie, throws on some Anthony Hopkins voiceover work that feels like it was lifted the Thor deleted scenes, then cuts to a homeless teenage girl fighting military-grade war machines by hand. And those are the good parts! But all is not lost. When Marky Mark and the robo bunch go to England, we get to meet Cogman, the snooty robotic butler. That may sound like snark, but I'm being sincere: Cogman is a highlight. He's used for comedic effect in a scene that, surprisingly, is actually comedic! In the movie, Cogman is a slender, human-sized robot, similar to C-3PO. That wouldn't make for a great toy (at least not a great Transformers toy - it's perfectly fine for a Star Wars toy), so Hasbro have turned him into a larger, thicker 'bot. Even if you ignore all the kibble on him, his frame is just stockier than the CGI character we saw on the screen. That said, the increased size allows for increased details, and we get some really nice elements in the sculpt, like the curving lines on his legs, the angles on the arms, and especially everything on the torso. Look at the amazing detail on the chest, the abdomen, the pelvis... everything is intricate and sharp, and the paint wash brings things out beautifully. 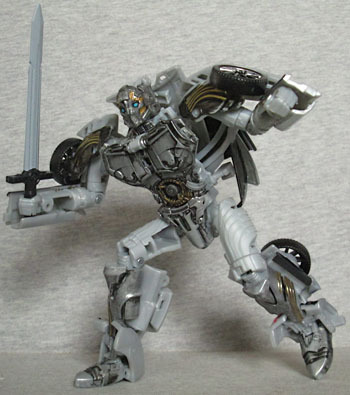 Cogman gets a weapon, and it's a weird one. Well, weird for Transformers, not weird in the context of the film. It's a sword, but not a fancy space-sword, just a simple, straightforward-lookin' blade. It's apparently supposed to be the Talisman sword Cade Yeager used (in other words, Excalibur for all intents and purposes), but in that case, why is it sized for Cogman and not for Marky Mark? The toy has enough articulation to look good wielding the sword (neck, shoulders, biceps, elbows, hips, thighs, knees), but it's still a weird choice. Cogman is introduced in the movie as a Headmaster, and then nothing ever comes of it - Anthony Hopkins says it, and then it's never mentioned again. What it means is that this toy has a removable head that's completely compatible with the Titans Return figures. So you can put a movie-accurate Cogman face on some non-movie bodies. If you want. And of course, that removable head turns into a tiny little robot, because of course it does. The idea being that this is Cogman's "true" robot form, the one we saw in the movie, and that the bigger bot is just one he's piloting. 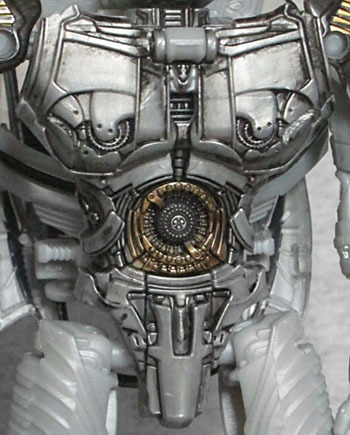 And oh my gosh, I just realized that the reason Cogman has a big circular element on his stomach is that it's meant to represent the screw that holds the Titan Master figures together. Is that stupid or brilliant? Stupid or brilliant? You know what, we're going with brilliant. Well played, designers! 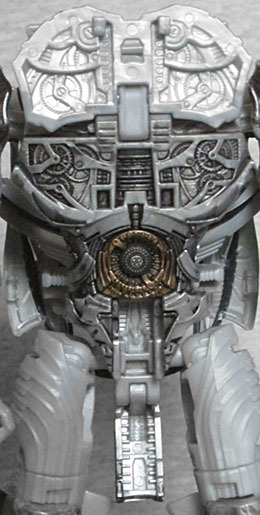 Small Cogman has a lot of the same sculptural details as the big one, though obviously they're hard to see. Cogman converts into an Aston Martin DB11, the car he drove for Anthony Hopkins. Side note: did any of the humans in Planet of the Earth have names, or were they just their actors? Just their actors, you say? Okay, good. Cogman turns into Anthony Hopkins' car. There's some good engineering here, too, particularly the way the car doors wrap around the forearms, or how the feet come out of the rear bumper. You have to remove the figure's head to convert him, because there isn't enough room for it to stay in place in car mode - there's a gap there, between where the shoulders raise up, but the plate that unfolds off the chest (revealing a lot of nice sculptural details you'd otherwise never see) would bump against the face if it were still there. But since the head turns into a robot, it can sit inside the car and drive. Or ride. 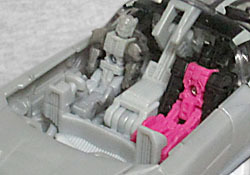 There are two seats, and he (or any other Titan Master) can fit in either. The sword gets stowed under the car, with the hilt acting as a tailpipe. 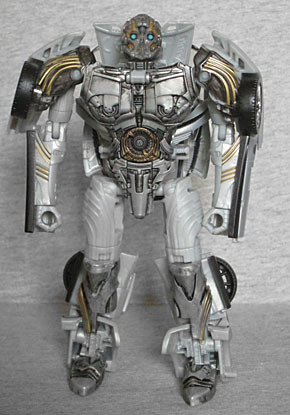 Cogman is a fun, (mostly) well-designed Transformer, regardless of his origin - give this same thing a blockier design and put him in the Generations line, and he'd still be aces. He even adds extra play value to what was already the best figure in the line! The only downside is that he's part of the third series of figures (aka, the one after Sqweeks), and thus unlikely to ever appear at retail. He's good for a normal price, not for a scalper price.